It is pretty difficult to find a more challenging and effective cardiovascular workout than climbing stairs. Walking or running up stairs will tax your legs, glutes and lungs while burning a tremendous amount of calories during each workout. Those of us who live in high rises where there have been elevator issues know just how challenging climbing dozens of flights of stairs can be – with a relatively low investment (compared to other gym quality pieces of equipment) you can get the very same, intense calorie burning workout right in your home gym. There are a number of companies out there that produce stair climber and stepper machines but few can compare with Stairmaster. Stairmaster has been producing incredibly innovative, commercial quality fitness equipment for more than three decades and remains at the forefront when it comes to this specific style of equipment. The 7000PT goes above and beyond what most people have in mind when they think of a stepper. This unique step mill features rotating stairs that are a full eight inches high to perfectly mimic climbing or running a real flight of stairs. There is no “short stepping” or cheating on this machine – when you get on the 7000PT you will be getting a good workout and you will be breaking a sweat. 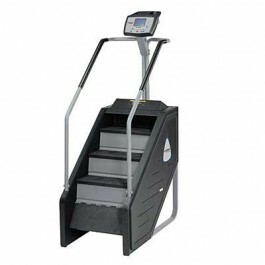 This high quality piece of equipment offers a multitude of easily scalable speed options allowing the user to tackle from 24 steps per minute all the way up to 162 steps per minute. This ensures that anyone from the fitness beginner all the way up to the elite level athlete can get a fantastic workout on the same machine with a simple push of a button. You also get access to multiple preprogrammed workouts and fitness tests so you can keep your workouts new and fresh and track your progress as you move along. With a base of just 50 X 29, this step mill can give you an excellent workout without taking up too much real estate. The biggest issue that some folks will have with this machine isn’t with function, it’s with fit. Due to the internal mechanics of this machine it stands fairly tall – if you don’t have relatively high ceilings where you are planning on putting it (the recommended is around 10 feet), it might not be a viable option for you. The 7000PT is one of Stairmaster’s most popular pieces of equipment and has been in their lineup for years. There are three different incarnations of this top quality machine, all that are capable of delivering the same intense workout, in a few different price ranges. All three of the available 7000PT step mills feature the full eight inch step and the multiple levels of speed and resistance – where the minor differences come in are in the console. The black console is the original 7000PT and features the most basic display of the three. You still get easy access to all of the pertinent information you need to get the best workout possible (calories burned, flights climbed, time, speed, etc.) with this machine – and you get it at the lowest price. Those who want a bigger, brighter screen with some improved functionality can opt to upgrade to the blue screen 7000PT or the newest version, the silver console 7000PT for a slight increase in price. Stairmaster has a great reputation for good reason – they have never stopped producing top quality equipment in their 30+ years in business. If you want a machine that will deliver a great workout that will tone your entire lower body, burn excess fat and improve cardiovascular fitness, you can’t go wrong with any version of the Stairmaster 7000PT.